When Al DesLauriers first saw the future Save-On-Meats building at 43 West Hastings, he was 12. He had just jumped off a streetcar to catch a Western at the theatre with his childhood buddy Ronnie Buyer, whose father was a butcher. Down the street, DesLauriers spotted a heavyweight, mechanical, rotating sign that read “Jones Tent and Awning”. It spanned two floors of the 21,800-square-foot building. 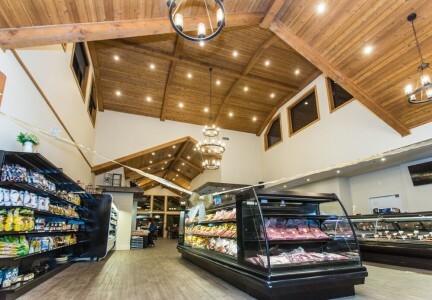 Young DesLauriers told Buyer that he was going to turn the business into a butcher shop one day, like his dad’s, but promptly forgot his promise by the time the first cowboy galloped across the screen. By 1957, when DesLauriers was a husband, father and, yes, a butcher, his employer, Sunny Wosk, acquired 43 West Hastings. Wosk and DesLauriers made an unusual verbal agreement: if DesLauriers would run the shop, Wosk would one day sell him Save-On-Meats. Save-On prospered, becoming one of the largest stores on the strip. 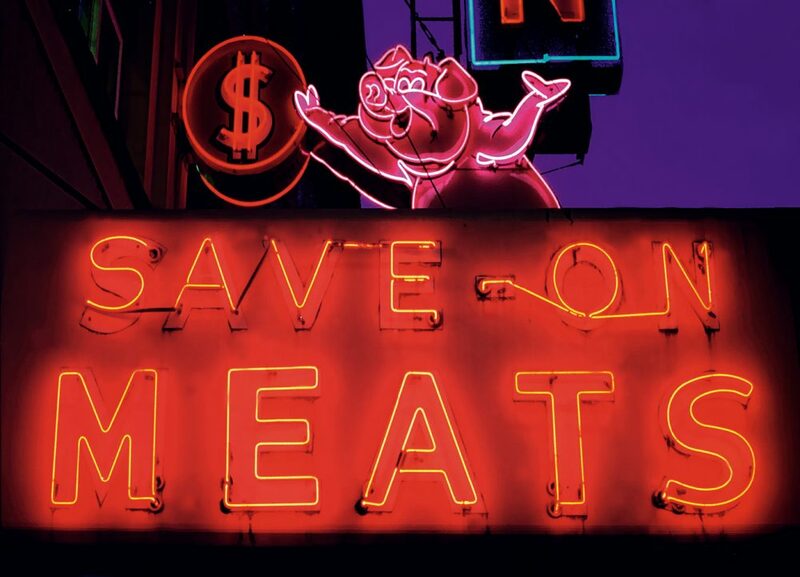 They worked with Wallace Neon to re-letter the pedestrian-halting neon sign, now complete with flying porkers, maintaining one of the 19,000 bright beacons of Vancouver’s glorious neon phase. In 1982, the night before DesLauriers purchased Save-On from Wosk for $650,000, he sat bolt upright in bed, recalling his childhood dream for the first time since he had it. Serendipitous as it was, DesLauriers took it as a good omen. But by this time, Vancouver had already begun to slowly turn away from the Hastings corridor toward other shopping centres in the Lower Mainland, like Pacific Centre and Metrotown, and breakups are never easy; storefront vacancy rates between Main and Cambie rose from four per cent in 1976 to 43 per cent in 2001. As heritage buildings around him were met with the wrecking ball, by 2009, at the age of 78, DesLauriers felt like the last man standing. 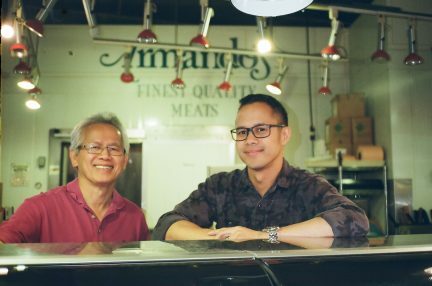 When his son wasn’t interested in taking over the business, DesLauriers didn’t blame him, but held out hope for a buyer who would carry on the surviving vestiges of the old Hastings community. He sold the building to a developer, and with it, along came a new tenant, Mark Brand, the magnate behind Gastown hipster restaurants Boneta, the Diamond, and Sea Monstr Sushi. Brand considers DesLauriers an East Van legend. 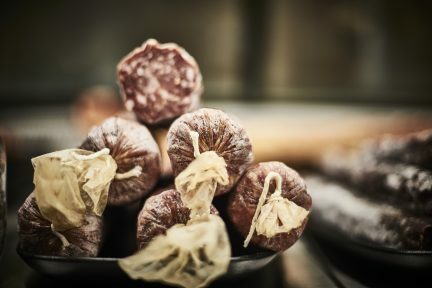 But when he came knocking with the idea to re-establish Save-On-Meats, DesLauriers held back at first, asking Brand how he was going to serve the neighbourhood. Beyond renovations, Brand told him that he also envisaged community employment programs through a restaurant linen service and by growing organic vegetables in a rooftop greenhouse. Most importantly, Brand gave his word that he’d keep the butcher shop going, and for that, DesLauriers passed the neon mantle (which both men agree is in constant need of loving care). By the time Brand had raised the ceilings and uncovered the original russet brick walls, which date back to 1899 and were lost under countless layers of plaster, DesLauriers was a believer. He’s tried the pie in the diner. His wife, Victoria, brings home meat from the butcher shop. “I had a vision—now Mark has a vision,” says DesLauriers. The neon pigs are safe, and the diner is full. Read more stories about Vancouver history.